Good Morning Sunday! I have a day to finally take a breath and relax...but not for long! 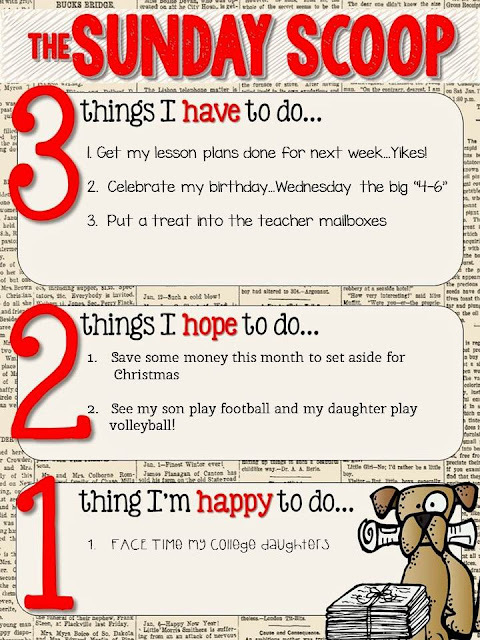 Thanks to some wonderful teachers over at the Teaching Trio I can share my Sunday Scoop! Here is the Scoop of my week to come...Little planning...a little game watching....a little birthday celebrating! It's that time of year when my kids start thinking Christmas. Finding ways to cut back to save a little extra is my goal this month. Any great cutting costs ideas out there? Yikes, thanks for reminding me to start Christmas planning. I did teacher treats after the first day of school. New pens with cute notes. Have a great Sunday! I love impromptu teacher treats. I just shared one that I am giving this week to go along with chocolate crayons. So much fun! As far as saving, I heard that some people will transfer money into their savings every time they stay home and eat. Whatever they would have spent eating out automatically goes into savings. Such a good idea! I'm with you, Christmas is going to come so fast!